With the arrival of decorative gourd season* it is time for all things pumpkin. 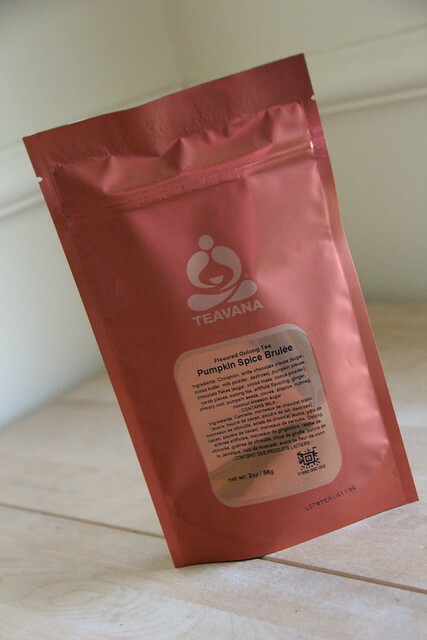 I was tempted last week when I saw a friend of mine gushing about Teavana‘s Pumpkin Spice Brulée and knew it was time to place an order. Pumpkin Spice Brulée contains cinnamon, white chocolate pieces, pumpkin pieces, chocolate flakes, carob pieces, oolong tea, ginger, chicory root, pumpkin seeds, cloves, allspice, nutmeg and coconut blossom sugar. It is available in the following sizes: 2oz for $12.98, 4oz for $25.96, 8oz for $51.95 and 16oz for $103.84, 3lb for $311.52 and 5lb for $519.20. While I’m not springing for the largest size, I assume this is a seasonal variety so you’d best get some while you can. When I first opened the package I could smell the chicory root and the chocolate. 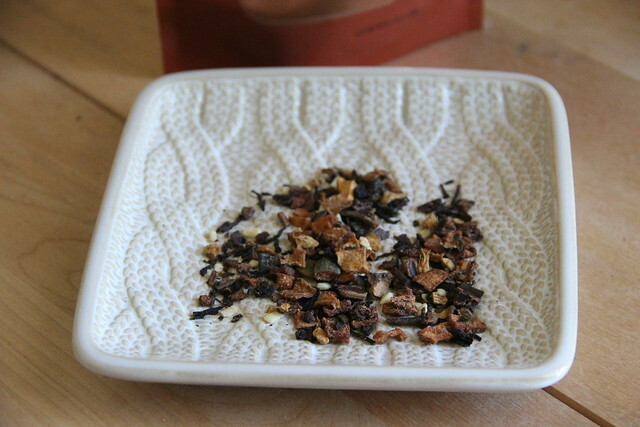 As the tea was brewing more of the spiciness came through: the ginger, the nutmeg, the cloves. I will say that the tea tasted more like spice tea to me, than pumpkin or chocolate. It reminded me of fall days and holidays and I would definitely recommend it if you like all things seasonal. * Link to inappropriate humor reference. Previous Teaccessories: Mugs for your tea bags.